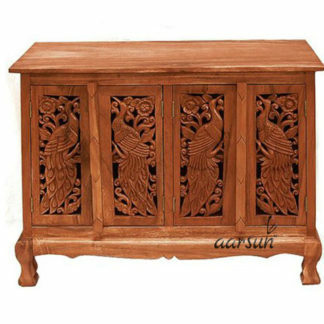 Aarsun Woods bring forth an excellent assortment of Peacock design Wood Cabinet made from premium quality Teak Wood with customization options. The design and finish can be changed as per your Home Decor. Order Now and get it delivered to your place without any hassles. We provide Wooden Crate Packaging to avoid any issues while in-transit. Any questions?? Call or WhatsApp +91-8192999135 to get each and every details.